They're two of the best laptops you could possibly buy. We'll show you how to choose. 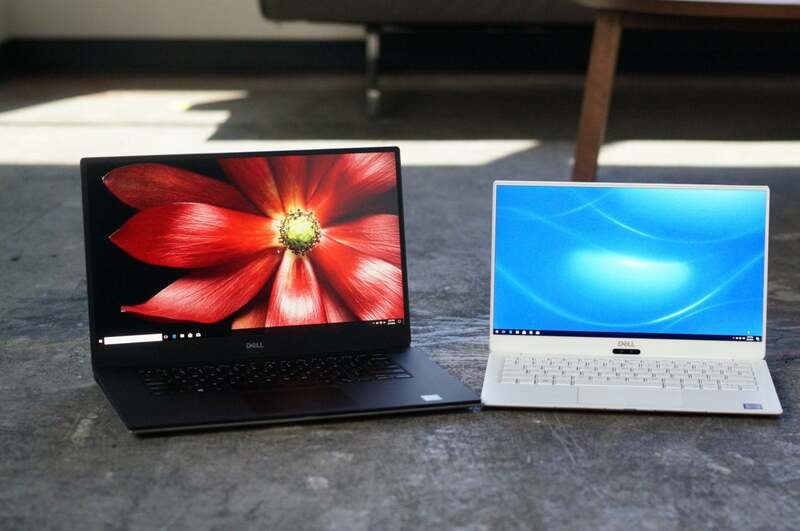 Assuming you want to stick with a traditional clamshell design rather than a new-fangled Dell XPS 13 2-in-1 or Dell XPS 15 2-in-1, we’ll help you pick between Dell’s most popular XPS models: the current XPS 13 9370 (with a starting price of $1,449 on Dell.comRemove non-product link) and the XPS 15 9570 (starting at $1,499 on Dell.comRemove non-product link). We’ve formally reviewed the latest XPS 13 9370, and our verdict: It’s tiny and stupidly fast. We’re still in the process of finishing our formal review of the XPS 15, but we’ve already done an in-depth dive into its performance vs. the new Macbook Pro 15 and the new Razer Blade 15. This comparison wouldn’t even be realistic if the prices weren’t competitive, so we looked at what we’d get if we plunked down about $1,500 for either laptop. Surprisingly, the XPS 13 9370 is a lot closer to the XPS 15 9570 than we expected. We compare the main features below. We actually thought we’d get a larger SSD or more RAM with the XPS 13, but the XPS 15 gives you twice the amount of RAM, a GeForce GTX 1050 Ti Max-Q, and a 6-core CPU for basically $50 more. The bang for the buck goes to the larger sibling. Size matters: The price of a Dell XPS 13 9370 is actually fairly close to the updated Dell XPS 15 9570. Then there are those little things that make your day go a easier. One feature we’ve been pretty happy with is Windows Hello support, which lets you log in using your face or finger. The XPS 15 finally features a fingerprint reader integrated into the power button, but it doesn’t have facial recognition. The smaller XPS 13 does, though, along with the same fingerprint reader. Both let you check the laptop’s battery status at the push of a button, and both have integrated Noble lock support. While this last feature seems like a given, some laptops no longer include lock ports, forcing you to resort to Rube Goldberg devices to keep your laptop from getting swiped in the blink of an eye. In the end, with its facial recognition, we’ll give the XPS 13 the edge. The XPS 13 supports three USB-C ports—two of which support Thunderbolt 3. All three also support video-out and charging. Unfortunately, that’s it. Dell left the square USB-A port behind for space reasons. And if you’re using USB-C for charging, you really only get two ports. Considering its size, the XPS 13 has decent port selection, but it can’t compare to the larger XPS 15’s. The larger XPS 15 offers the ports you’d expect, including a full-size HDMI, Thunderbolt 3, and two USB-A ports. Although you can charge the XPS 15 by USB-C, it has a dedicated barrel charger port, too, so everything is open. The anti-reflective screen on the XPS 15 is better for your eyes, but damn, that Gorilla Glass 4-protected XPS 13 panel looks luscious. Obviously 15.6 inches is bigger than 13.3 inches, but beyond that is there a preference with the panels? Both offer 4K resolution versions with touch support (and battery life will suffer on both if you max out the resolution and brightness). On the far more common 1920x1080 panels, it’s a tough one. 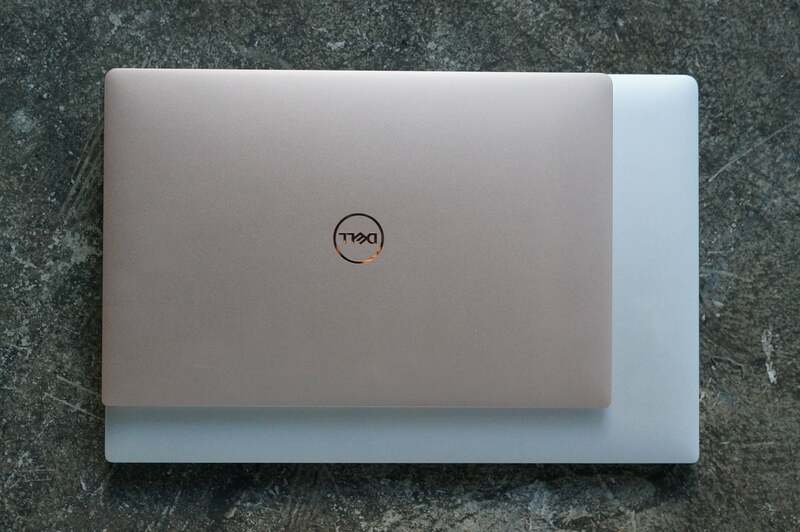 The XPS 15’s FHD panel comes with an anti-reflective coating that’s easier on your eyes, but it looks all-work-and-no-play. The XPS 13’s panel comes with Gorilla Glass 4 which simply makes everything appear luscious. We actually think the XPS 13 and XPS 15 have trackpads that rank among the best. Both are glass-smooth and are correctly sized so we rarely, rarely ever have palm rejection issues. While the keyboards look the same, the keys on the smaller XPS 13 are actually larger than the keys on the larger XPS 15. Let’s say that again: The keys on the XPS 13 are 16.1mm wide, while the keys on the XPS 15 are 14.7mm wide. 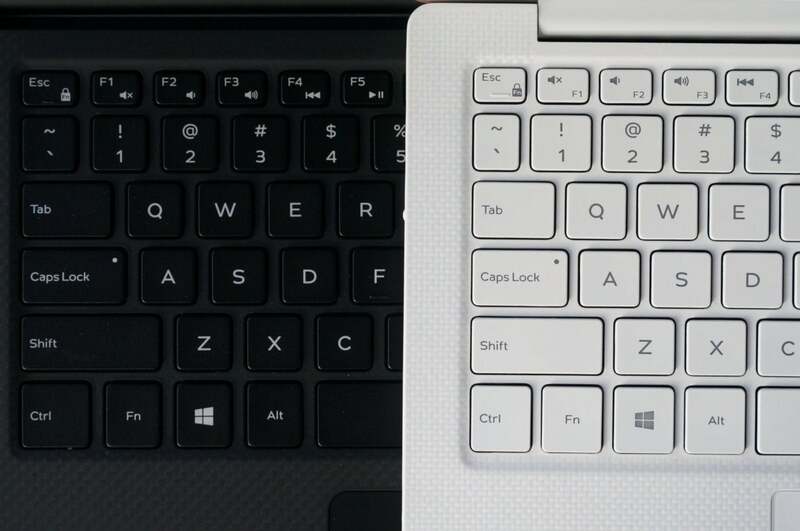 That may not sound like much, but we’ve long felt the keys on the XPS are just a smidge smaller than we’d like. We embrace the slightly larger XPS 13’s keys. The refreshed—well, fresher anyway—XPS 13 9370 has larger keys than the updated XPS 15 9570. 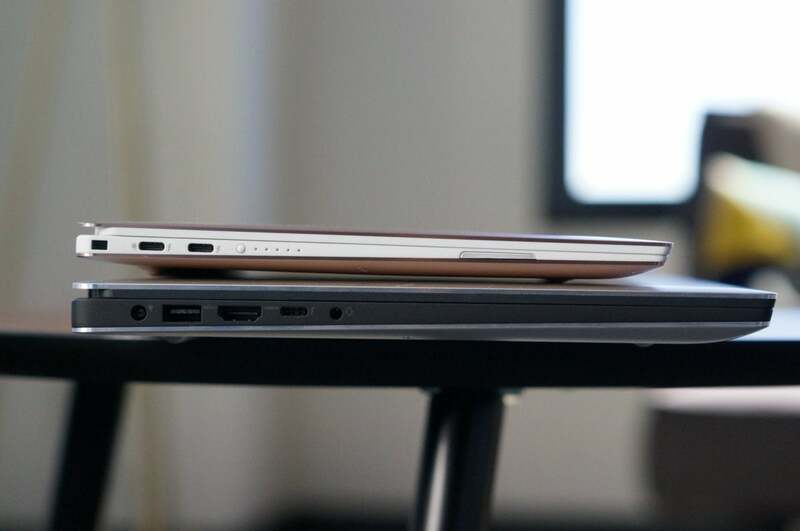 Beyond how luxuriously great a 15.6-inch screen feels next to a 13.3-inch, we don’t have to say much about how great it is to slip a tiny, 2.7-pound laptop into your bag rather than a 4.5-pound laptop. The XPS 13, in fact, feels so tiny, it’s hard to remember that just two years ago, this was how big a laptop was with a tiny 11-inch screen. No duh: the XPS 13 is significantly smaller and lighter than the XPS 15. It’s truly amazing that Intel’s 8th-gen Core CPUs have squished quad-core capability into laptops that could only fit a dual-core last year. You know what’s even more amazing? That Intel’s 8th-gen Core CPUs can cram six cores into something you could only get with four cores last year, too. And yeah, that six-core CPU simply smokes in the XPS 15, in ways even the fastest XPS 13 never could. How fast? 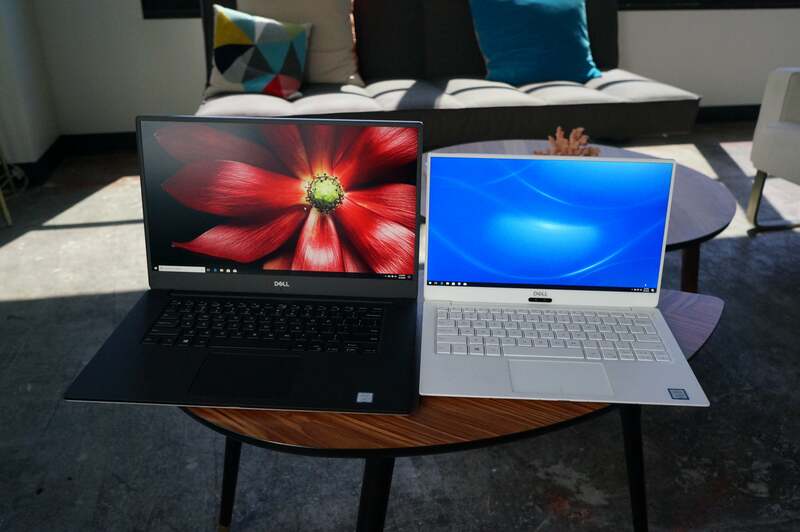 The XPS 13 with a Core i5 has outperformed comparable laptops outfitted with the Core i7. Compared to the XPS 15, however, It’s just hard to beat the simple math that 6 > 4. That’s not even mentioning the performance of the XPS 13’s Intel UHD 620 graphics vs. the XPS 15’s GeForce GTX 1050 Ti Max-Q GPU. This one was over before we wrote the first word. Because battery life is such a critical metric to many, we break out the performance of both laptops, looking at how long they can play a 4K video in airplane mode. The XPS 13 performs valiantly, pushing just over twelve hours of playback before dying. Unfortunately, the XPS 15 easily bests it with just over 14 hours of 4K video playback. How is it possible for a higher-performance (and theoretically power-hungrier) laptop to win this fight? The most obvious reason is the battery size: the XPS 15 has nearly twice the battery capacity, at 96Wh vs. the 51Wh fuel tank in the XPS 13. Even though the XPS 15 has demanding CPU, RAM, and graphics components to feed, video is usually handled by the integrated graphics cores in the CPU. For the most part, the high-performance parts are kicking back and playing dominoes. Certainly playing a game or a video encode, or anything that works the GPU or CPU cores hard will drain the battery faster, but video playback is actually among the easiest chores a laptop can do today. In the end, the winner is clear. The larger battery helps give the XPS 15 the win here, but the smaller XPS 13 represents well too. You know why there are nine Supreme Court justices? To avoid splits like this. Even though we didn’t intend for this to end in a tie, it’s exactly what we have. In the end, your personal needs will guide you. If you’re looking for dominant performance and bang for the buck, the XPS 15 is the one to get. If you value portability and can “settle” for good performance, the XPS 13 is the go-to unit. 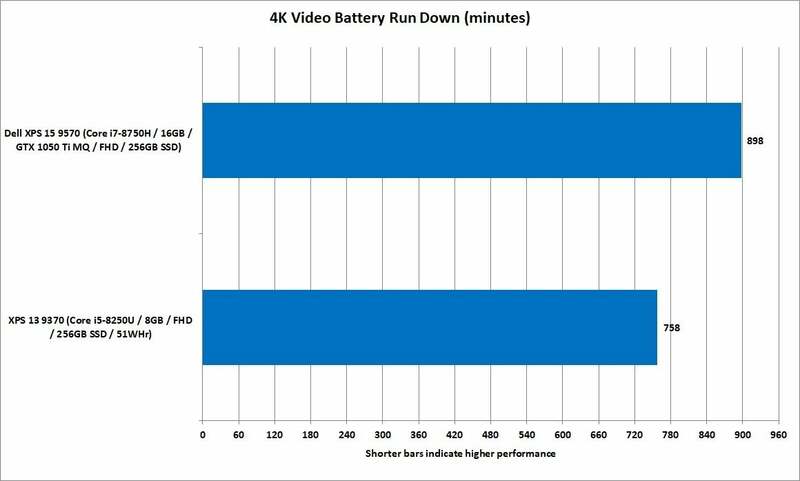 Correction: Due to an error in a chart, we understated the battery run time of the XPS 13. PCWorld regrets the error.